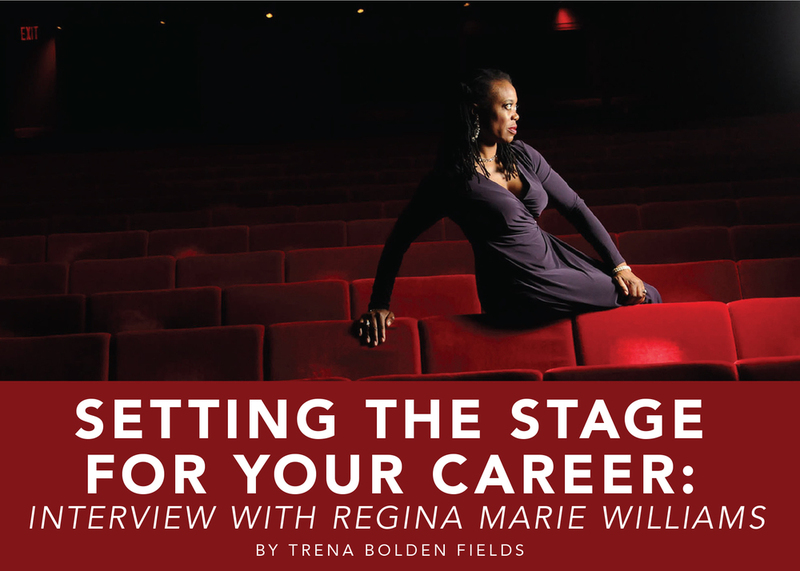 Watching Regina Marie Williams will make you believe in the power of acting and performance. Her ability to bring truth and life to each and every character she portrays shows us her maturity, work ethic and understanding of the importance of building a solid career. She is sophisticated, warm, welcoming, and inviting, not to mention curious, well-versed and fierce. I recently sat down to interview the award-winning actor. We agreed to meet at the renowned Guthrie Theater in Minneapolis. As I sat watching her photo shoot and waiting for our interview, I melted in the red velvet seats of the McGuire Proscenium Stage. Surrounded by the quiet of the deep rich red walls, I could not help but feel excitement knowing that I would also watch Regina perform the following week as Emilia in Guthrie’s production of Othello. Then suddenly, there she was reappearing after a wardrobe change, breaking the silence with her stunning plum-colored evening gown; the picture of studied grace, energized and ready for her photo shoot. As Regina stood amongst the seats waiting for the shoot, I got a sense that she is the model of a prepared actor always ready for her moment. During her next wardrobe change, I heard Regina singing from the dressing area — vocal warm ups, perhaps preparing for her rehearsal taking place later in the day. She has a gorgeous and dazzling voice that illuminates any space. Regina then tells me about the time while she was in high school. “I remember being taken to something...it was Evita...it might have been the big Broadway production that came to Los Angeles.” The piece sparked her interest enough that she began in earnest to take classes in the Watts neighborhood. She remembers taking a class with Eartha Kitt. “It is so delicious,” drip from her lips as she recalls acting and doing different types of roles. Regina has always been a doer; following through on her passions and goals in life. Moving on from classes in Watts, Regina became involved in the Thespian Society and was blessed with the opportunity to “traipse” around the world, visiting Europe and the Globe Theatre. She performed her first monologue for the Thespian Society while in high school and booked her first professional job as a performer in Sesame Street Live at the age of 18 while studying at Los Angeles Community College. Auditioning for a dance role in Sesame Street Live, she felt she could not keep up, but she still made a huge impression on the choreographer and the producers by doing something that came naturally to her, helping. Regina offered to fold programs before her audition. When describing her audition for her highly acclaimed role as Dinah Washington in Dinah Was she says, “You have to use every tool or opportunity. When mechanics go out to work, they do not have one tool, they have every tool in their tool bag.” She feels that actors need to have the same mindset. Actors need to have different tools in preparing and performing for a role. Regina knows about using every tool at her disposal. “I wanted to be Dinah, so I did the research. I listened to her music…I found books on Amazon...I had a music chart done and I rehearsed it three times.” She even had one of her close friends and fellow talented performer, Jevetta Steele, help her prepare. Regina leaned forward in her seat recalling her conversation with Steele, “‘Jevetta, I need a wig that looks like this for Dinah Washington.’” She held her hands out to me, evoking the image of Washington’s famous hair style. “Do you have something like that?” Soon after, courtesy of Steele, Regina walked into her audition wearing the Dinah wig, full make-up, an evening gown and a fur coat. Her advice on this lesson learned: “If you do everything in your power sometimes the rest isn’t up to you.” Booking this role led Regina to being able to create a body of work that has continued to bring opportunities into her life. Regina also shared her sentiments on the business of acting. She suggested actors research theatres’ seasons and study them and decide where they fit into that season. “Then call the director or producer and let them know you are interested in auditioning for that role...it is extremely key for actors to build relationships. You have to be proactive and that...is brilliant. You never know what a theatre is going to do. You have to start thinking that maybe the script could be done a different way. If they do not think of it, maybe you should think of it and make that phone call anyway.” She emphasizes how being bold about asking to be considered for a particular role will help you get in front of more people. “You won’t know when the opportunity will come, but being proactive will get you more results. Don’t walk around quietly; I am not saying make a big noise, but make yourself known." Making herself known has led Regina to many opportunities. In 2005, as she prepared for another Guthrie production, she was asked by John Miller-Stephany, Associate Artistic Director, to understudy the role of Hildy Johnson played by Angela Bassett in Guthrie Theater’s His Girl Friday. When taking Bassett on a tour of the Cities, Regina was able to share her favorite places in Minneapolis with Angela Bassett. Regina connected with Bassett and invited her over to her house for a home cooked meal. This connection led to Regina’s interview with Entertainment Weekly. During Bassett’s own interview, she told Entertainment Weekly what music she had in her CD changer and it was Regina is...the songs of Dinah Washington by Regina Marie Williams. Being present, making choices and continuing to move and take advantage of her moments is what has helped Regina build a fabulous career as an actor. Her career lessons are universal and necessary for any actor wanting to set the stage for their career. Oh, and what did I think about Regina Marie Williams’ performance as Emilia? It gave me chills!